Taking a break form E-learning _ Mathias Vestergaard Corp.
During the past seven years I’ve been doing quite a lot of projects evolving around the concept of e-learning. Most recently, I worked with Finanssektorens Uddanelsescenter (the Educational center for financial institutions) creating small games and other activities to give the user a break from the actual learning. The games are of course customized to match the visual identity of the client’s existing system. 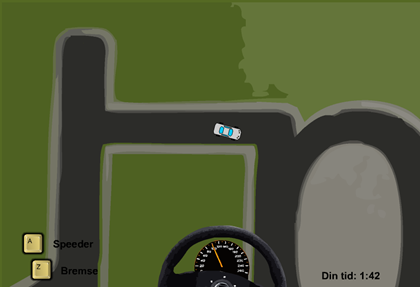 The screenshot above is taken from a car racing game. In addition to being action packed, it is also a challenging motoring task, since the steering wheel is controlled by dragging the mouse to the left or right, while the acceleration and brakes are controlled by the keyboard. In addition to the car game, you can also find a puzzle and memory game. You can read about the memory game here. This entry was filed under E-learning, Websites.